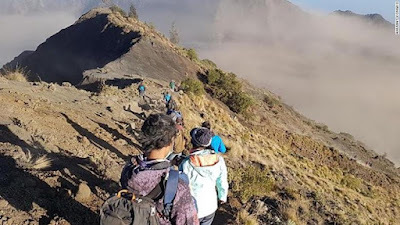 Heavenly Father, we pray for the rescue operation happening on Lombok’s Mount Rinjani in Indonesia. We pray for the hundreds of hikers representing at least 26 nations who are trapped on this active volcano after yesterday’s earthquake. We are so thankful for how many have already been rescued. Please be with the rescued hikers as they recover from their trauma and seek medical care as needed. Lord, we pray that those hikers who are still trapped be rescued as quickly and safely as possible. Please protect and guide those who search in the midst of the challenging, post-earthquake conditions. Lord, we pray for those who are trapped in hidden places. Give them the strength and ability to make themselves accessible and/or known. May your Holy Spirit guide rescuers specifically to places where they would not typically search if there is someone there to be found. We pray for those whose injuries make it difficult for them to be removed from the mountain. Give rescuers creativity in getting them to medical care in a timely fashion. We pray for peace among those who wait. May a spirit of generosity and selflessness reign, rather than any sense of competitiveness or conflict. Please glorify yourself in the midst of this difficult situation. In Jesus’ name we pray, amen.